Welcome to the website of the American Planning Association's Hazard Mitigation and Disaster Recovery Planning Division. Planners are frequently called upon to advise municipalities, counties, regions, states and federal agencies concerning risk reduction and disaster recovery. Many members of APA have been involved in providing pre- and post-disaster assistance in their respective communities, while others serve as academic researchers or consultants. 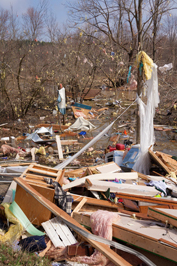 APA members have an inherent and significant interest in making communities safer from natural and man-made hazards and in planning recovery from resulting disasters. The Hazard Mitigation and Disaster Recovery Planning division fosters professional communications on these topics and builds a stronger knowledge base for use by planners.